You have just entered "A Moment Of Time." What I call my photo file. Why "A Moment Of Time?" Because that is what outdoor photography is, capturing an image in fractions of a second - in a moment. No outdoor photo will ever be exactly the same again. The sun shifts, the wind blows, a leaf falls, the bug hides. Something always changes. Time never stands still. Within this area, you will find images of the four seasons, plus some which are non-seasonal and can be used anytime. Because I have thousands of shots on file, what you see is only a small sampling which I will change from time to time. Look through each category - spring, summer, autumn, winter, and no season - to get a general idea of the subjects available to you. When you find something you like, contact me. All images are digital, either direct or scanned. All photos in this site are low res, low dpi. Purchased images will be sent high res, at 300 dpi, or whatever your specs might be. Please refer to the season when making inquires about a particular shot. All are available for publication or prints. Contact me with your queries at mrmrsprg8@wi.rr.com. Please use "website" as the subject. Thanks . Now, scroll through the drop files; look at the wide variety of images. Enjoy! Oh yes! Remember, this is a site in constant flux. What you see today, may have changed tomorrow. By the way, this shot was not a set up. I found it as you see it. 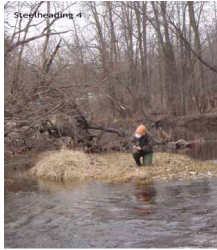 It shows our oldest daughter kneeling on a small island in a small creek. She is changing flies. Trying to find something the steelheads holding to her left will take. If she were there when this is being written, only her head would be showing. Rains had swollen the creek that much. As I said, outdoor photos always change. Sometimes drastically.